hello, thanks foy your plugin. it's really powerful! as you can see, it's possible to upload a maximum of three images (1 body thumbnail + 2 attachment thumbnails). now i need to add a lightbox to the 2 thumbnails inside the content. 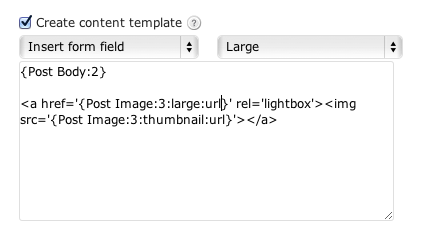 i already installed the wpslimbox plugin (that automatically add a "rel='lightbox'" in the images links). but how can i make it work for my thumbnails? is there a way to add a link to the images? You would have to use the Content Template feature of the Post Body field to configure a Content Template for the Post that is created. You would then have to write your own markup for the thumbnail images. If you append :url to the end of the merge tag for the Post Image it will return only the full path URL to that image, it won't include any predefined markup. So then you need to wrap it in your own markup. That example created a Content Template and has a link to a full size image with an image as the link that is the thumbnail image. Whatever appears in your Content Template will be used to create the Post. Think of it like when you are editing the Notification Message or your Form Confirmation, whatever appears there is what will be used to create your post. i also need to align the thumbanails to left. You would have to write the actual HTML to do what you want to do, using the merge tags where appropriate. The screenshot I link to above shows an example of doing what you want to do. That is the code you would use. If you want to align the thumbnails to the left then you'd have to write the HTML to do so.